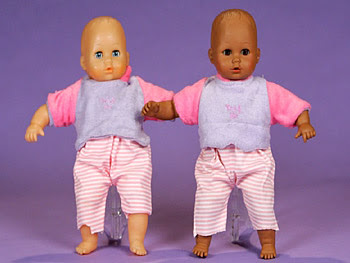 This panel met at Howard University to discuss the black doll - white doll test. 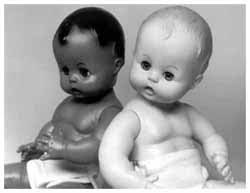 For those who are unfamiliar, the famous doll test was a survey taken years ago, where black school age children where asked positive and negative questions about black and white dolls. To sum things up, the kids overwhelmingly preferred the white dolls. The test was run again recently with the same results. Panelist joining Brian Williams included: radio host Tom Joyner, author Michael Eric Dyson, entrepreneur Malaak Compton-Rock, screenwriter Kriss Turner, writer Kevin Powell, and columnist Mike Barnicle. Tim Wise, the Director of the Association for White Anti-Racist Education (AWARE) and Rev. Buster Soaries. MSNBC's panel needs improvement. In that, it is understandable that MSNBC's intended to get a well rounded diverse panel to discuss race, but they missed the mark. Chris Rock's wife is not a scholar. Although she's seems to be quite active with charity work, but she needed to be a black female counterbalance to Dr. Michael Eric Dyson. There are some great black female scholars like Dr. bell hooks, Dr. Alice Walker, Dr. Toni Morrison, and Dr. Francis Cress that have written, researched, published, and presented scholarly works on black female images and popular culture. Mike Barnacle and Brian Williams should have been required to read Toni Morrison's The Bluest Eye, before they even opened their mouths. None of the panelists have any idea how painful it is to be black, female, dark and ugly. Chris Rock's wife is too beautiful to know how painful it is to be considered ugly by society. One more criticism on this panel. Who the hell invited the police! I guess if we're gonna talk about black folks then we need to call the cops. WTF! While I can deal with Chris Rock's wife, and Micheal Eric Dyson......the cops are just too much. It just subliminally reinforces the criminal stereotype of blackness. Negrophobia propaganda rears it's evil head once again. Lastly, why the heck is Mike Barnacle on the panel? If MSNBC must give a white male voice, there are some excellent scholars on the subject like Eric Foner, David Bryon Davis, David Blight, et al. If MSNBC is going to teach, then there are some great professors that do this for a living they should cast their nets a little wider for panel discussions. These are just phony panels on race. I agree what the heck did the cops have to do with the doll test. Do African American kids have to have police supervision to discuss the notion of racism and the legacy of slavery? MSNBC says, quick get the cops on the show. You never can be too cautious when it comes to a room full of black folks discussing racism.